The traditional Peking Duck recipe dates back hundreds of years to Imperial China where it was typically served just to the Emperor. 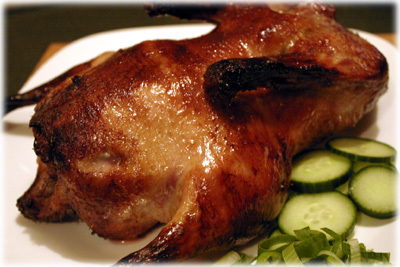 It's most famous for it's delicious crispy skin which is achieved by first bathing the duck in a mixture of boiling water, maltose syrup and various spices then allowing it to dry for 24 hours in the refrigerator before roasting. 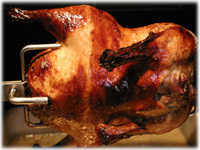 I wanted this recipe for peking duck to be one that anyone can make at home so I've taken the best aspects of all the available recipes I've found and combined them here including using your grill's rotisserie to roast the duck. 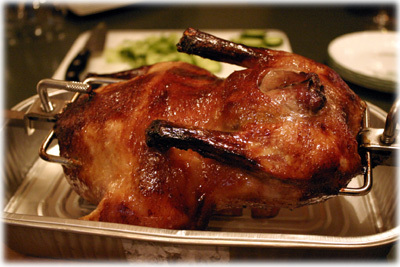 The traditional Peking Duck recipe uses compressed air blown between the skin and meat to separate it which allows the fat to escape during cooking and in turn makes the skin even crispier. Most people don't have easy access to compressed air so for this recipe you'll just separate the skin from the meat by hand, which is pretty easy. Also, most people won't be able to find maltose syrup so we use honey instead which is only slightly sweeter but works just as well. After cooking the duck it's typically carved in very thin slices with the skin and meat separated. A piece of skin and a small amount of meat is served on chinese pancakes with slivers of green or spring onions, cucumbers and hoisin sauce. If you can't find (or make) chinese pancakes try torn slices of soft tortilla shells or naan bread, these work just as well. 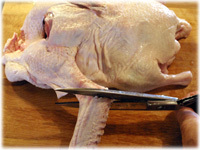 Purchase a 3 to 4 pound duck, remove any giblets from the cavity and rinse under cold water. Trim the wings back to the first joint, they'll only burn if you don't. Important: Work your fingers between the skin and the meat of the peking duck and separate them. Do this over the entire bird, this helps ensure the fat runs off the meat and makes the skin nice and crispy, the most important part of the peking recipe. Pierce the skin in several places with a fork. 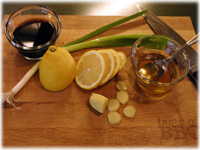 Prepare the ingredients for the birds bath including the honey, soya sauce, rice wine vinegar, sherry, lemon, green onion and garlic. 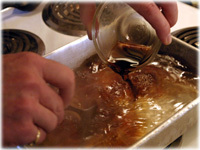 In a stove-top safe pan slightly larger than the duck 1/2 fill with water and bring to a gentle boil. 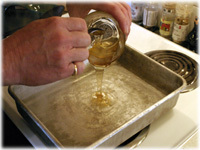 Once the water is boiling pour in the honey and stir well to dissolve. Pour in the soya sauce, sherry and vinegar and stir well. Add the corn starch that's been dissolved in warm water to the liquid and stir well to combine. 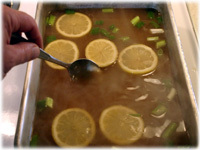 Add the sliced lemon, ginger and green onion and let simmer for 10 minutes. 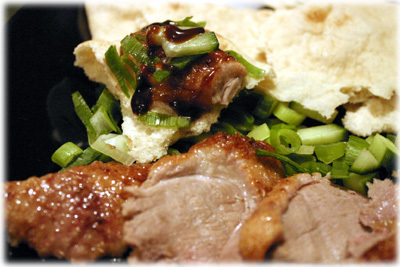 Turn off the heat and gently place the peking duck into it's basting sauce. Spoon the basting sauce recipe over the duck for 5 minutes. Flip the duck over in the liquid and baste the other side for another 5 minutes. Place the basted duck on a cooling rack over a plate slightly larger than the duck and place in the refrigerator, uncovered, for 24 hours. 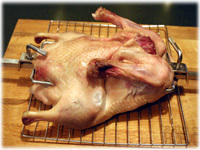 Remove the duck from the refrigerator and insert the bbq rotisserie skewer in one end and out the other end of the duck. 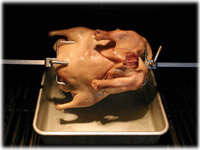 Fasten the duck to the skewer using the adjustable prongs. 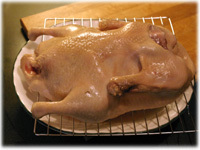 Place a drip pan slightly larger than the duck on the grates and attach the spit to the BBQ rotisserie unit. 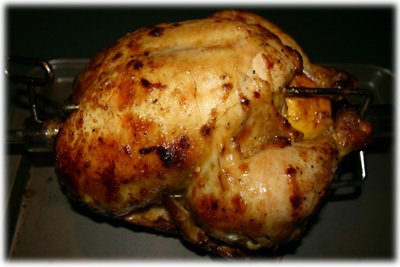 Begin spinning the rotisserie and close the lid. In about an hour check the internal temperature of the duck, in the breast is a good spot. 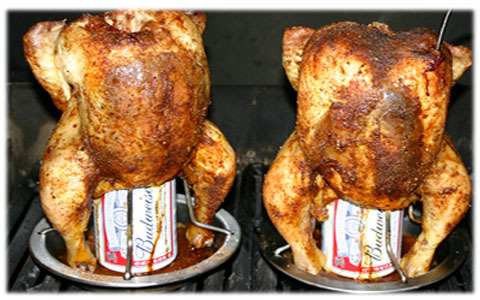 If the thermometer reads 165F then it's time to remove the bird from the grill. Cover and let it rest about 5 minutes. After resting begin cutting off some of the skin and cutting some thin slices of the duck meat. Serve a piece of crispy skin with a small piece of meat on a chinese pancake (or soft tortilla or naan bread) with some sliced onions, chopped cucumber and hoisin sauce for drizzling.